Tanny Raw is a huge force in the High Carb Low Fat Raw Vegan community: not only does she practice the lifestyle herself, but even more powerfully she serves as a health and wellness coach, truly working to transform the lives of her many followers. Tanny Raw’s website was well overdue for a total overhaul, her previous one light on information and functionality despite growing demands from her followers. 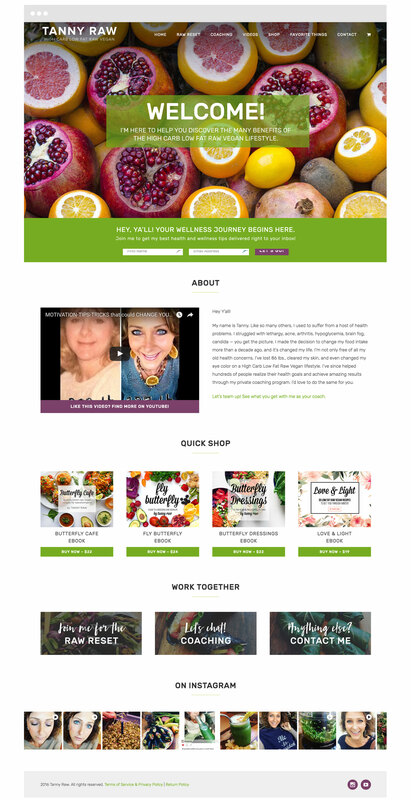 The new website needed to accomplish a few goals: an easily updatable and user-friendly e-commerce solution, an emphasis on her Raw Reset program, and making sure that her many YouTube videos were embedded and easily accessible. The result is a colorful, cheerful site filled with information—just like Tanny herself!